Born in Musselburgh in 1859, Peter Paxton was one of the truly great club makers with his clubs highly prized even in his lifetime. He learned both his golf and his club making in Musselburgh, starting as a caddie, and learning from Willie Park senior’s brother David, at least how to play golf, but possibly also something of ball and club making. One suspects a strong Park influence given that he produced both bulger drivers (as invented by Willie Park) and compressed club heads, a technique of bending the head so that the grain ran down the neck and along the head to give the neck more strength, a process patented by Willie Park. A more formal training on club making was also provided in the town where he was one of Tom Hood’s first apprentices. He was a very good golfer, runner-up in the Open of 1880 and, like many Scots golfers of his day, took the road south and took over the position of professional from his brother John at the Worcestershire club in Malvern. 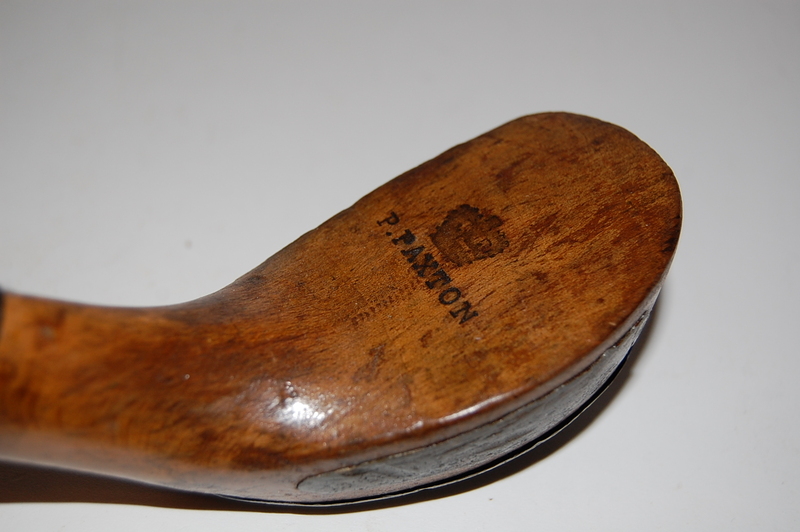 He was professional at several other clubs including Royal Eastbourne and Tooting Bec, but his real passion was club making and making golf balls. 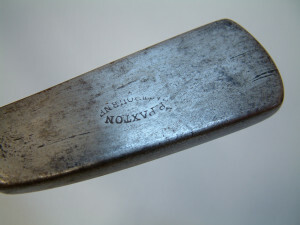 He was a fine craftsman but he also demonstrated a strong innovative streak with the creation of a machine for turning out two or three thousand gutta balls weekly in 1892; a patented grip; a combined club cover and stand; square socketed clubs and clubs made from an exotic wood he called sylviac (which may have been itauba). When he left Royal Eastbourne in 1893, he took four skilled club makers with him to his new position at Tooting Bec and was, by then, using a crown as a mark on his clubs to reflect the royal patronage of the Duke and Duchess of York. Horace Hutchison once wrote, “In 1886 my father took a house at Eastbourne, and I was no longer at Westward Ho! as constantly as before, although a frequent visitor there at the house of Claud Carnegie. He and I used to have many matches on terms that are rather to be commended as a means for bringing together two players of different handicap. We used to play level, but I had to give him five shillings before starting and at the end he paid me back a shilling for every hole that I was up. It came, of course, to the same thing as giving five holes up, but it is rather a more amusing way of stating those odds. The five shillings puts me in mind of a very much more gambling match that was played about that time, when I was at Hoylake. There was at that date a very festive company of Edinburgh golfers going about the various links under the leadership of old Mr. Robert Clark, who edited the great book on golf. There was Sir Walter Simpson, who also wrote a great golf book and was the son of the doctor who discovered the blessed uses of chloroform, Hall Blyth, Valentine Haggard, Cathcart, Jack Innes, and a few more—all, I fear, except Hall Blyth, gone over to the majority. Five of these warriors started out one day at Hoylake to play a five ball match, for a fiver a hole, and—this was the prudent stipulation of Mr. Robert Clark, in his ancient wisdom—they were to settle up at the end of each hole. The man who happened to fall into bad trouble would thus have to part with four fivers on the putting green, so it must have needed a well-filled note-book to make a man sure of living through to the finish without bankruptcy. I had suggested that a six ball match would be really more fun than a five ball, and that I was willing to make the sixth; but the well meant suggestion was not taken in good part. I forget the ultimate result of the encounter. Naturally I was at Eastbourne a good deal, as I had no other home than my father’s, and I arrived just at the time of the first laying out of the original nine-hole course there. Mayhewe was the most active of its originators, and he and I planned it together. It implies no reflection on the designers of the later eighteen-hole course to say that the old nine holes were better than any of the later developments. It is a very different problem laying out nine from eighteen holes on the same circumscribed piece of ground; for the later additions to the area do not amount to a great deal. It is annoying to me now to think how ignorant we were in those days of the proper treatment of inland putting greens. We could plan the rest of the course well enough. But the great idea was to keep on rolling and rolling and rolling with the heavier roller the better, until we had the surface just round the hole so slick that if there was any gradient at all the ball would not stay near the hole even if you placed it there by hand. There was (there still is) a green called “Paradise”—and no green was ever named more aptly according to the classic principle of lucus a non lucendo. If you were below the hole, and below it on this green you were sure to be, because the ball would not rest above, you might putt up to the hole, and if you missed the hole the ball would come trickling down to you again, and so you might go on putting “till the cows came home.” By which time there might probably be a little dew which possibly might allow your ball to come to rest in the hole’s vicinity. But long before that you would have come to the conclusion that golf, on Paradise green, was not a good game. 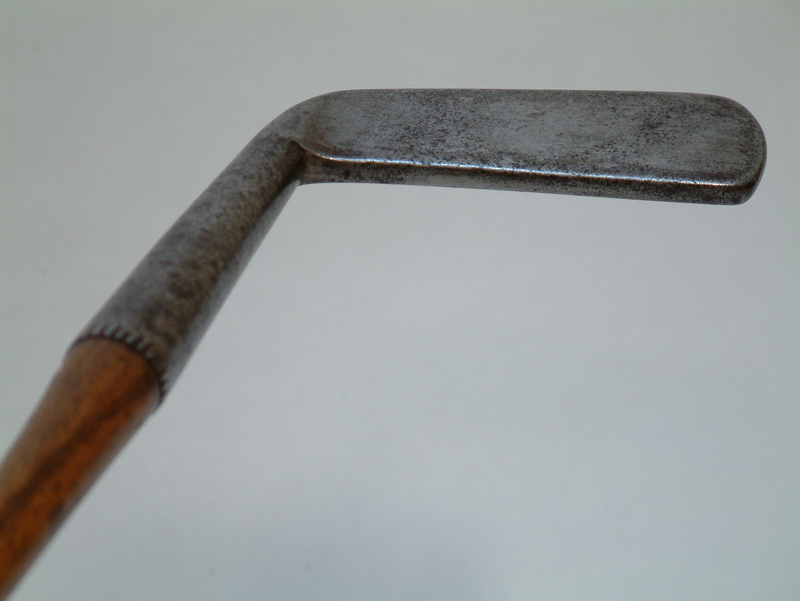 Our device would be to cut some jagged raw edges to stick out on the ball’s surface, before driving off the tee for this hole. 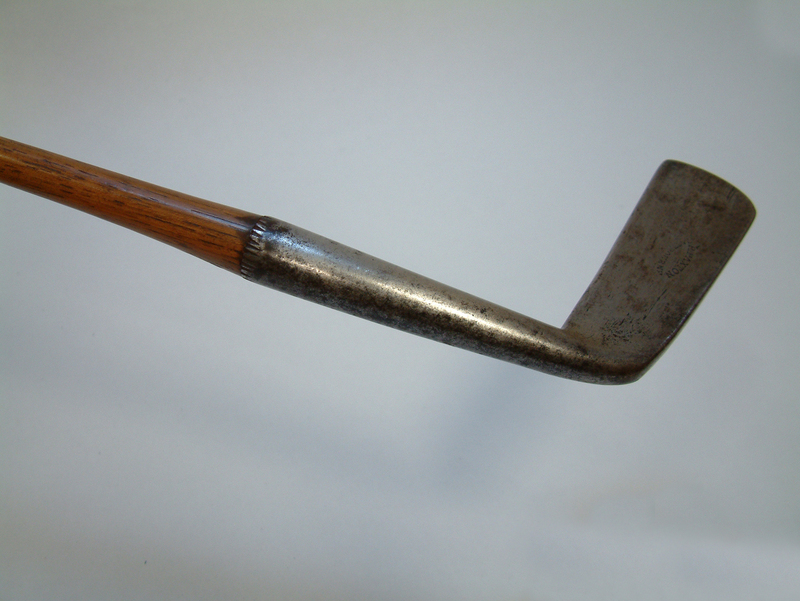 Thus jagged, the ball would not fly properly, but it was better to lose a shot, owing to the jaggedness, through the green that to lose twenty on the putting green. Only a handful of clubs exist that attach Willie Davis, the first clubmaker to work in North American with Royal Montreal Golf Club, the first club established in North America. This is one of them. The shaft is stamped ” W.F. 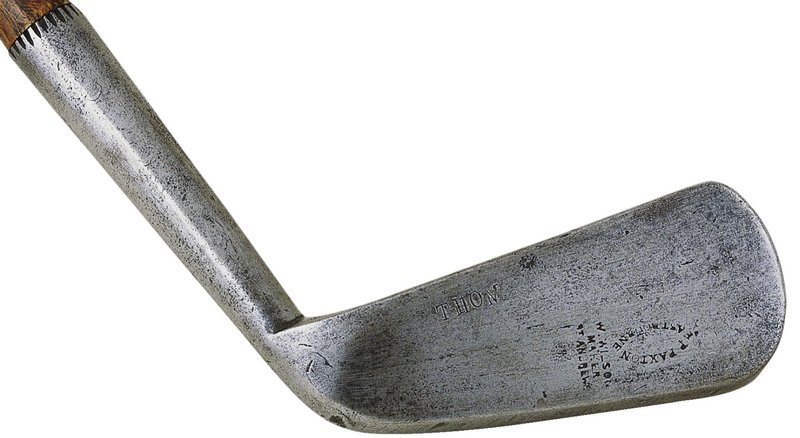 (Willie) Davis,” who came to Montreal in 1881, and “Montreal Golf Club,” founded in 1873 (see lot 374). A possible scenario explaining the other various marks is that the iron clubhead was forged by William Wilson at St. Andrews in Scotland for Peter Paxton, the professional at Eastbourne on the south coast of England, who in turn sold it to Davis, who shafted it in Montreal and sold it to a customer named Thom. On the rough edges of its scars the ball would come to rest, even in Paradise. However, this is a picture of that green at its most grievous worst. 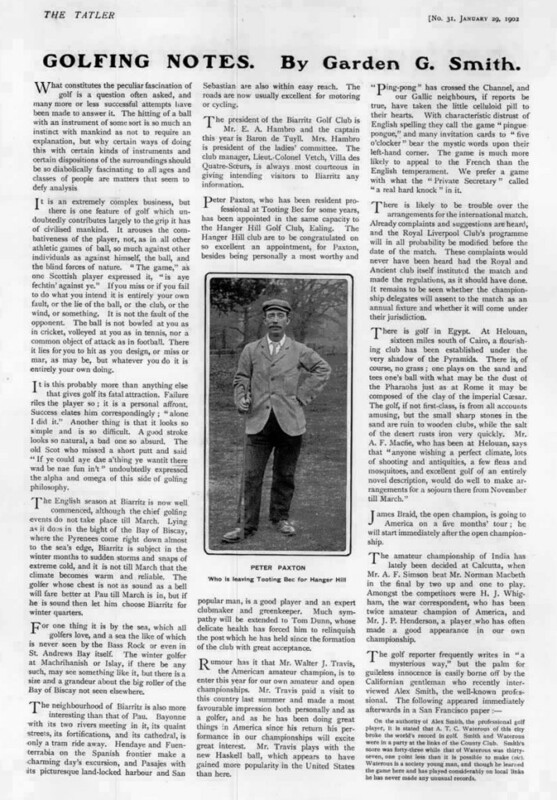 It was not always thus, and on the whole the course, with its drives over a great chalk pit and over the corners of one or two high woods, gave us good fun and was not a bad test of golf. 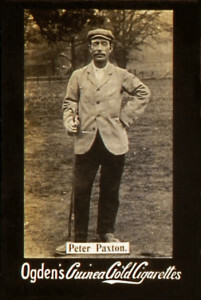 Peter Paxton was the professional, a humorous little fellow and a wonderful putter on these tricky greens. I remember, when he sent in his credentials, he added the comment, “and, Sir, I drink nothing stronger than cold water.” I liked the “cold;” as if he feared that water with the chill off might go to his head. This course at Eastbourne, be it understood, was technically of the “inland” kind, though at the seaside. It was of the chalk down soil; and it was among the first of the new supply of inland courses which the ever-spreading vogue of golf demanded.